I remember reading an article by Bruce Tognazzini (AKA “Tog”) many years ago about how extensive research at Apple indicated that using the mouse is faster than using shortcut keys on the keyboard. This always seemed wrong to me, but after using a Mac somewhat regularly for the past few weeks, I think I’m beginning to understand. 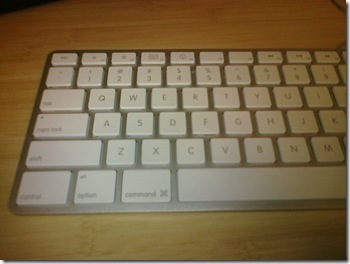 When doing shortcut keys on a Mac, you typically use the Command key, which is right next to the spacebar. The trouble I have is that I don’t know which finger to use to push the Command key. No matter which finger you pick, you’re guaranteed to have to move a hand off the keyboard home row. If I have to do something like Command + Shift + F, it actually takes some cognitive effort to get there. Contrast this with a Windows shortcut, which typically uses the Control key. It’s in the corner of the keyboard (even on the Mac keyboard above), which means it’s easy to put a pinky down there and still stay anchored on the home row. Maybe the lesson to be learned from the research is not “optimize for the mouse” but rather “move the shortcut key”.